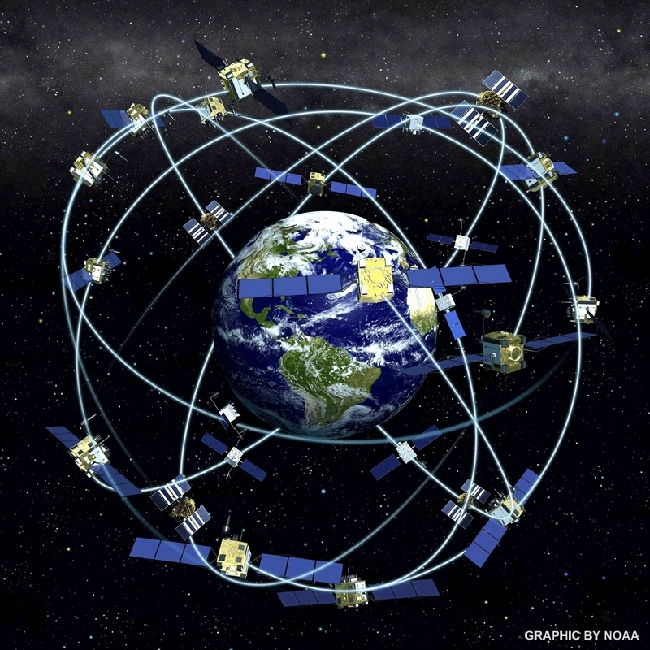 Answer: There’s actually a ton of math behind how GPS (also known as “Navstar”) works, but I’ll try to keep it simple. The key process is what’s known as geometric triangulation. First, click on the thumbnail below to see how triangulation works in 2D. 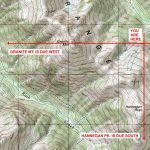 This is how back-country hikers and surveyors used to locate their position. All you need is a compass heading to two different landmarks. 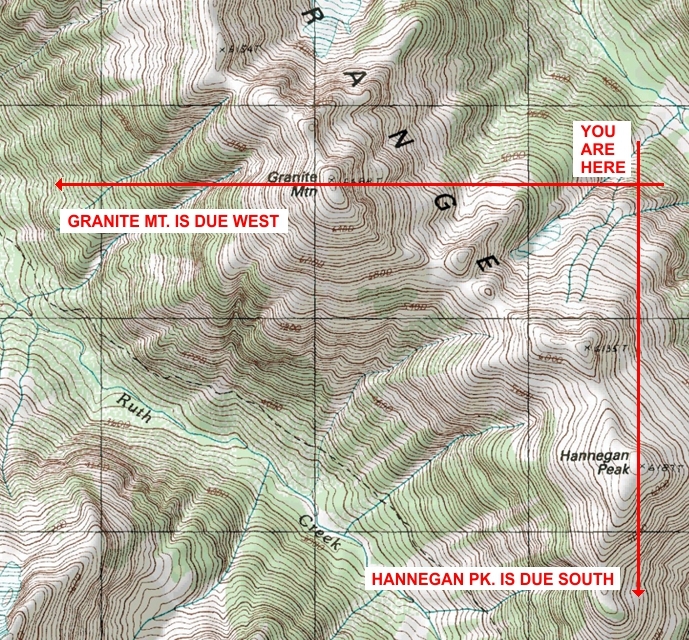 When you plot those on a map, the place where the two sight lines intersect must be where you are. I kept it simple by using “due west” and “due south” instead of degree measurements, but it’s the same idea. These days, of course, you can find your location nearly instantly using GPS. But putting those GPS satellites 20,180 km (12,540 mi) up in space makes finding your location a 3D calculation. So two headings are insufficient to solve the problem — you need at least three headings. That’s what I’m showing in the top graphic. 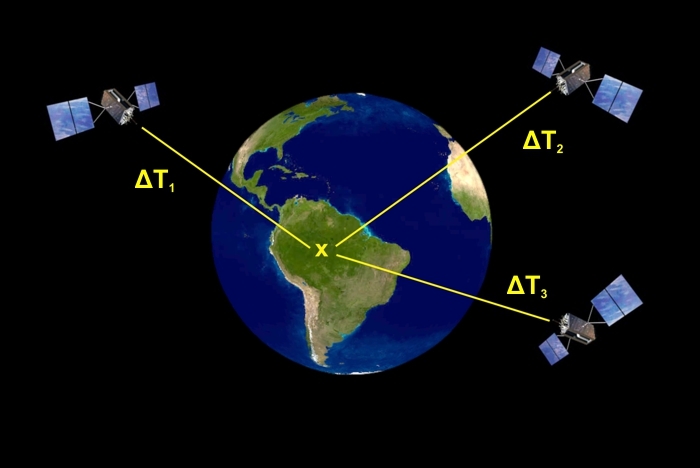 In practice, a GPS receiver (what you have in your car or smart phone) needs a fourth satellite in view to provide information about timing and keep the clock in your device synchronized with the satellites. 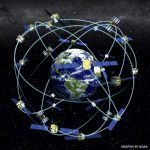 All GPS satellites carry extremely precise atomic clocks, accurate to within 100 nanoseconds (0.0000001 second) of system time. If you had a clock that good in your receiver you wouldn’t need that fourth satellite. So when your receiver gets a lock on at least four GPS satellites (more can be used to improve accuracy) what you actually receive are four signals telling you what time they were sent and from what location. Each signal has a different delay depending on the satellite distance. When you know the delay, you can calculate the distance using: d = cΔT (where c = the speed of light). Now you know the actual length of the three yellow lines in the top graphic and can calculate your position using 3D geometry. You get longitude, latitude, and altitude. Plus you get your clock synchronized. There’s currently 32 GPS satellites up there, including some for backups. That guarantees you’ll see at least four of them most of the time from anywhere on Earth. And they orbit in several different planes to improve global coverage. Click on the thumbnail below to see a graphic of the GPS fleet. So that pretty much answers your question, JK. We needed a little math and geometry, but that’s about as simple as I can make it. It’s nice to have computers do all the hard calculations — all you need to do is point your smart phone and find that elusive Gyarados.